For the language, see Island Carib language. 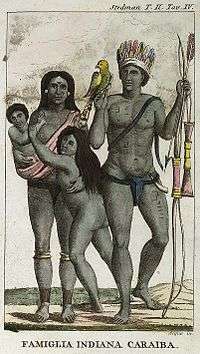 At the time of Spanish contact, the Kalinago were one of the dominant groups in the Caribbean, which owes its name to them. They lived throughout the Windward Islands, Dominica, and possibly the southern Leeward Islands. Some historians believe their ancestors were mainland Kalina who conquered the islands from their previous inhabitants, known as the Igneri. However, linguistic and archaeological evidence disputes the notion of a mass emigration and conquest; the Island Carib language appears not to have been Cariban, but Arawakan like that of their neighbors, the Taíno. Irving Rouse and others suggest that a smaller group of mainland Kalinago conquered the islands without displacing their inhabitants, eventually adopting the local language but retaining their traditions of a South American origin. In the early colonial period Kalinago had a reputation as warriors who raided neighboring islands. Early Europeans claimed that they practiced cannibalism – the word "cannibal" derives from a corruption of their name. However, Europeans may have embellished these aspects to rationalise enslaving the Kalinago. Nevertheless, according to the source cited, Giovanni de Verranzano was cannibalized by members of the group [cit. 20 Verranzano]. He was an explorer commissioned by the King of France to explore the east coast of America, including Nova Scotia. A reasonable assumption would be that Verranzano brought with him the first Acadiens, a name now corrupted to Cajun, to Northern America. It would seem unlikely that the story of a famous explorer being eaten by a primitive tribe had been "embellished." Today, the Kalinago and their descendants continue to live in the Antilles; some interact and mix with the Garifuna or so-called "Black Caribs", a group of mixed Carib and African ancestry, who also live principally in Central America. The Kalinago are believed to have migrated from the Orinoco River area in South America to settle in the Caribbean islands about 1200 AD, according to carbon dating. Over the two centuries leading up to Christopher Columbus' arrival in the Caribbean archipelago in 1492, the Kalinago mostly displaced the Maipurean-speaking Taínos by warfare, extermination, and assimilation. The Taíno had settled the island chains earlier in history, migrating from the mainland. The so-called 'Black Caribs' (later known as carifuna) of St. Vincent (St. Vincent has some "Yellow Caribs" as well) were descended from a group of enslaved Africans who were marooned from shipwrecks of slave ships, as well as slaves who escaped here. Chief Kairouane and his men from Grenada jumped over the “Leapers Hill" rather than to face slavery under the French invaders have served as an iconic representation of the Kalinago spirit of resistance. They intermarried with the Carib and formed the last native culture to resist the British. It was not until 1795 that British colonists transported the so-called "Black Caribs" to Roatan Island, off Honduras. Their descendants continue to live there today and are known as the Garifuna ethnic group. Kalinago resistance delayed the settlement of Dominica by Europeans. The so-called "Black Carib" communities that remained in St. Vincent and Dominica retained a degree of autonomy well into the 19th century. Because of Dominica's rugged area, Kalinago were able to hide from European forces. The island's east coast includes a 3,700-acre (15 km2) territory formerly known as the Carib Territory that was granted to the people by the British Crown in 1903. There are only 3,000 Kalinago remaining. They elect their own chief. In July 2003, Kalinago observed 100 Years of Territory. In July 2014, Charles Williams was elected as Kalinago Chief, who succeeded Chief Garnette Joseph. It is said that they are the only remaining full-blood native Kalinago people, although some have intermarried with the non-Kalinago Dominican population. Several hundred ethnic Kalinago descendants live in Puerto Rico, U. S. Virgin Islands, St. Kitts & Nevis, Antigua & Barbuda, Guadeloupe, Martinique, Dominica, St. Lucia, Grenada, Trinidad, Aruba as well as in St. Vincent— where live "Black Caribs", descendants of the mixture of African slaves and Kalinago succeeded in the 18th century, the size of which is not known. Some ethnic Kalinago communities remain on the American mainland, in countries such as Venezuela, Colombia, Brazil, France (French Guiana), Guyana and Suriname in South America, and Belize in Central America. The size of these communities varies widely. 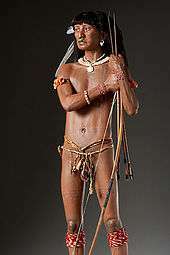 The Kalinago were of a medium height but in general were of a taller stature than the Arawaks. They were described as being stronger than the Arawaks reportedly due to the emphasis placed on training for warfare. Their skin was of a brown hue and they were usually naked. It was very rare for their loins to be covered. The women painted their skin with a red dye called Roucou, with which they made fantastical decorations of many colours. The eyes of the females were usually circled with black. The men also painted their bodies and on occasion wore feathered headdresses, jewellery through their lips, and jewellery through their noses. They also wore the Caracoli which was a necklace of small bones along with the teeth of defeated enemies from which a crescent shaped ornament was suspended. The Caracoli was worn to represent the courage of the wearer. Kalinago are believed to have been polytheists. As the Spanish began to colonise the Caribbean area, they wanted to convert the natives to Catholicism. The religion practised by the Kalinago had elements similar to the ancestor worship of the Taíno. 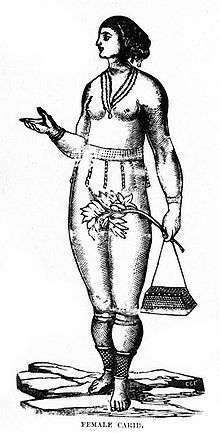 They believed in an evil spirit called Maybouya, who had to be placated for an individual to avoid harm. The chief function of their shamans, called buyeis, was to heal the sick with herbs and to cast spells (piai) which would keep Maybouya at bay. The buyeis were very important and underwent special training instead of becoming warriors. As they were held to be the only people who could avert evil, they were treated with great respect. Their ceremonies were accompanied with sacrifices. 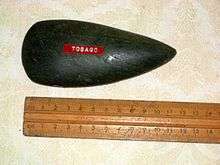 As with the Arawaks and other Native Americans, the Kalinago smoked tobacco in the rituals of their religion. Early Kalinago culture was patriarchal. Women carried out the domestic duties of rearing young children, processing and producing food and clothing, and cultivating the land for farming, including sowing and harvesting. Men carried out the tasks of hunting for food and protecting women and children from attack by other warring tribes. In the 17th century, Europeans reported that the women, with their children, lived in separate houses from men, a custom recorded among other South American tribes. The women were highly revered and held substantial socio-political power. Island Kalinago society was reputedly more socially egalitarian than Taíno society. Although there were village chiefs and war leaders, there were no large states or multi-tiered aristocracy. The local self-government unit may have been the longhouse dwellings populated by men or women, typically run by one or more chieftains reporting to an island council. The Kalinago ate almost the same foods as the Tainos. They did not farm very well so they relied less on maize and cassava but still knew how to grow them. Although they were not very good farmers, the Kalinago were excellent fishermen and were not afraid of long voyages. Their diet consisted of lots of protein: they ate manatees, ducks, iguanas, and lots of fish among other foods. However, the Kalinago had many myths and beliefs about diet. They believed that eating pig would give one small beady eyes, they also believed eating turtle meat made one stupid. In doing so, they deprived themselves of the easily available meat in the West Indies. They also believed that eating crab before a voyage would bring storms. The Kalinago seasoned their food with pepper but did not use salt. Couii and taumalin were pepper sauces. Taumalin was made from pepper, lemon juice and the green meat of crab. The Kalinago made ouicou , a cassava beer with a strong alcoholic content, and got very drunk on festivals and holidays. Although their diet was not quite so varied as that of the Arawaks, it was well balanced, prepared in many different ways and served with different seasonings. Garifuna music from the Garifuna people, the descendants of Kalinago, Arawak and West African people, is quite different from the music in the rest of Central America. The most famous form is punta. Its associated musical style, which has the dancers move their hips in a circular motion. An evolved form of traditional music, still usually played using traditional instruments, punta has seen some modernization and electrification in the 1970s; this is called punta rock. Traditional punta dancing is consciously competitive. Artists like Pen Cayetano helped innovate modern punta rock by adding guitars to the traditional music, and paved the way for later artists like Andy Palacio, Children of the Most High and Black Coral. Punta was popular across the region, especially in Belize, by the mid-1980s, culminating in the release of Punta Rockers in 1987, a compilation featuring many of the genre's biggest stars. Other forms of Garifuna music and dance include: hungu-hungu, combination, wanaragua, abaimahani, matamuerte, laremuna wadaguman, gunjai, sambai, charikanari, eremuna egi, paranda, berusu, punta rock, teremuna ligilisi, arumahani, and Mali-amalihani. Punta is the most popular dance in Garifuna culture. It is performed around holidays and at parties and other social events. Punta lyrics are usually composed by the women. Chumba and hunguhungu are a circular dance in a three-beat rhythm, which is often combined with punta. There are other songs typical to each gender, women having eremwu eu and abaimajani, rhythmic a cappella songs, and laremuna wadaguman, men's work songs, chumba and hunguhungu, a circular dance in a three-beat rhythm, which is often combined with punta. In the Garifuna culture, there is another dance called Dugu. This dance is a ritual done for a death in the family to pay their respect to their loved ones. In 2001, Garifuna music was proclaimed one of the masterpieces of the oral and intangible heritage of humanity by UNESCO. The Kalinago had a tradition of keeping bones of their ancestors in their houses. Missionaries, such as Père Jean Baptiste Labat and Cesar de Rochefort, described the practice as part of a belief that the ancestral spirits would always look after the bones and protect their descendants. The Kalinago have been described as vicious and violent people in the history of the people who battled against other tribes. Italian explorer Giovanni da Verrazzano was killed and said to have been eaten by Kalinago natives on what is now Guadeloupe (French West Indies) in 1528 (before called Karukera by the Amerindian people which means “the island of beautiful waters”), during his third voyage to North America, after exploring Florida, the Bahamas and the Lesser Antilles. Historian William Riviere has described the cannibalism as related to war rituals. Columbus and his people did not understand what they were seeing, and they were shocked at this cannibalism. In 1503, Queen Isabella ruled that only people who were better off under slavery (a definition which explicitly included cannibals) could legally be taken as slaves. This provided Spaniards an incentive and legalistic pretext for identifying various Amerindian groups as cannibals to enslave them and take their lands away. To this day, the Kalinago people fight against what they regard as a misconception about their ancestors. The film Pirates of the Caribbean: Dead Man's Chest was criticised by the National Garifuna Council for portraying the Kalinago people as cannibals. In Myths and realities of Caribbean history the author Basil A. Reid concluded that "No evidence, either archaeological or from firsthand observations by Europeans, conclusively proves that Island-Kalinago ever consumed human flesh." ↑ Rouse, Irving (1992). The Tainos. Yale University Press. p. 21. ISBN 0300051816. Retrieved May 22, 2014. ↑ Rouse, Irving (1992). The Tainos. Yale University Press. pp. 22–23. ISBN 0300051816. Retrieved May 22, 2014. ↑ Newton, Melanie J. (2014). "Genocide, Narrative, And Indigenous Exile From the Caribbean Archipelago". Caribbean Quarterly. 60 (2): 5. ↑ Crouse, Nellis Maynard (1940). French pioneers in the West Indies, 1624-1664. New York: Columbia university press. p. 196. ↑ Margry, Pierre (1878). "Origines Francaises des Pays D'outre-mer, Les seigneurs de la Martinique". La Revue maritime: 287–8. ↑ Menhinick, Kevin, "The Caribs in Dominica", Copyright © Delphis Ltd. 1997–2011. ↑ Harper, Douglas. "Cannibal". Online Etymological Dictionary. Retrieved 12 February 2015. ↑ Reid, Basil (2009). Myths and realities of Caribbean history. University of Alabama Press. p. 88. ISBN 978-0-8173-5534-0. Wikisource has the text of the 1911 Encyclopædia Britannica article Caribs.